Just come home after a long day's work and realized the fridge is empty? No energy left to go and buy some groceries to fix a quick dinner? Well, if you can find a can of chickpeas in your pantry or get one from the neighbor, then dinner might be saved. I avoid canned foods with one exception: chickpeas. In fact, I recommend to always have canned chickpeas at home. In no time, they can be made into something extraordinary, like hummus or this cumin-scented chickpea soup. Chickpeas are very filling, while being low fat and a good source of protein. Other health benefits include having a low GI, lowering cholesterol, being a very good source of fiber. The spices used in this soup, are equally beneficial for health. Cumin is known for improving digestion, strengthening the immune system, helping with insomnia and helping a healthy metabolism. Turmeric is said to be a natural pain reliever that also helps keeping flu at bay. It has cholesterol-reducing proerperties and helps stabilize blood sugar levels. What else can you ask for than a delicious, warming and filling soup that is whipped up in 15 minutes and that is so overtly good for you? 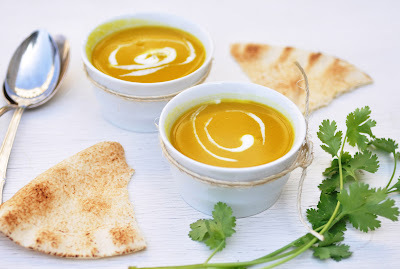 This soup ticks all the boxes of a health-conscious meal. In a medium-sized pot, heat the olive oil over medium heat. Add onions and garlic and fry until onions are translucent. Add cumin and turmeric and fry for another minute. Add the chickpeas and vegetable stock. Bring to boil, then simmer covered for 10 minutes. Let cool a little before blending the soup until smooth. To get the right consistency, add more vegetable stock to thin the soup, or simmer another few minutes to thicken. Stir in sour cream or yogurt. Ready to serve.